St. Martin's Griffin, 9780312302504, 208pp. Dr. P.M. Forni (1951-2018) was an award-winning professor of Italian Literature at Johns Hopkins University. 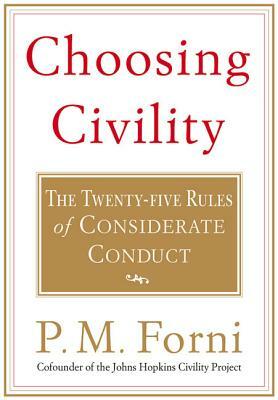 In 2000 he founded The Civility Initiative at Johns Hopkins and taught courses on the theory and history of manners. He is the author of Choosing Civility: The Twenty-five Rules of Considerate Conduct (2002), The Civility Solution: What to Do When People Are Rude (2008) and The Thinking Life: How to Thrive in the Age of Distraction (2011). Reports on his work have appeared on The New York Times, The Times of London, The Washington Post, The Wall Street Journal, and The Los Angeles Times. He has been a on a number of radio and television shows, including ABC's World News Tonight, CBS Sunday Morning and BBC's Outlook. He lived in Baltimore, Maryland.